Some several years after her Father’s disappearance on a quest, Lara Croft (Alicia Vikander) still refuses to accept that her Father is dead and will not accept her vast inheritance. Working as a courier is failing to pay her bills and she reluctantly has to accept what is coming to her. Whilst signing to accept her Father’s last will and testament she uncovers a clue as to his fate and embarks upon a mission to solve the mystery surrounding his disappearance. This leads her to an uninhabited island off the coast of Japan in treacherous waters but she is not the only party interested in what lies on the island and faces a race to reach the tomb of the First Queen of Japan who, myth says, was laid to rest there having ruled using black magic throughout her reign. 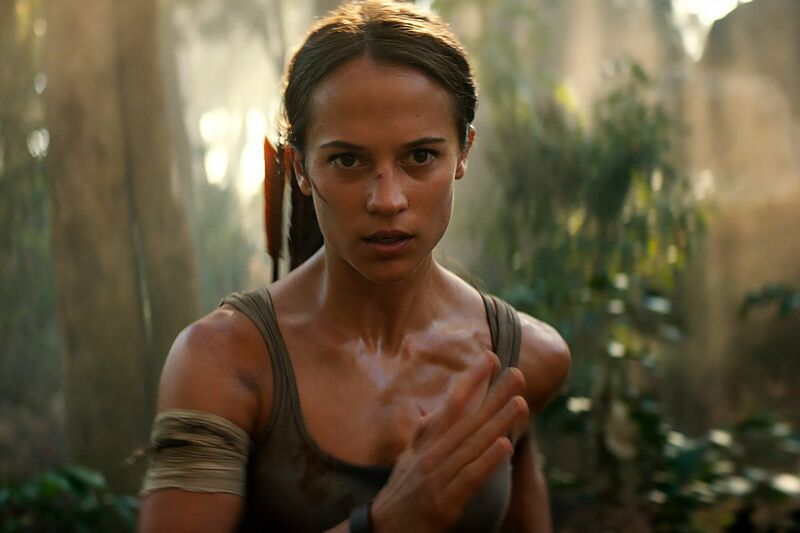 When I heard Alicia Vikander was lined up to play the Lara Croft I thought this was a good choice. She certainly looks the part in line with the more recent versions of the video game. I was pleased she didn’t force the English accent the way Angelina Jolie in her two outings as Croft. It gave you impression she was taking the role a bit more seriously than Jolie did. She also strikes me as a good actress who can get into the action role. It’s worth remembering that this is more of an origins movie than the earlier movies and, as such, she doesn’t start out as the all-conquering action hero, quite the opposite. Vikander does a decent job of Lara’s journey but in fairness the story really isn’t good enough so it feels like her efforts were somewhat in vain. She also doesn’t have much in the way of decent support. I’ve never really been a fan of Dominic West and he hasn’t changed my opinions here. In his defence, the script is not great and he repeatedly has to refer to his daughter as “Sprout” and this gets very tired, very quickly. He just came off as wooden and unremarkable. As the chief bad guy, Walton Goggins character Mathias Vogel completely fails to stir any feelings of antipathy from the viewer towards him. It may again be as a result of poor writing that this character came across as instantly forgettable. He just lacked any charisma and didn’t give you any reason to consider him a real threat to Lara Croft. Overall, this incarnation of Tomb Raider left me feeling like it was neither better nor worse than Jolie’s efforts which are scarily getting on for being twenty years old. Video game transitions to big screen rarely translate well but to be fair you play the game yourself whereas you have no control of what happens in the movie which will always seem frustrating. Visually, you have to say that it looks very much like a Tomb Raider movie should look but behind that a weak story doesn’t keep the pieces moving with any great interest. There’s a brief moment after about eighty minutes where things pick up a little but outside of that the film doesn’t really excite or thrill. If they decide to do more I recommend they need to review their story writing and script teams very closely to try to get something that pulls the viewer into Lara Croft’s world. Stars: Jennifer Lawrence, Joel Edgerton, Matthias Schoenaerts, Charlotte Rampling, Mary-Louise Parker, Ciarán Hinds, Joely Richardson, Bill Camp, Jeremy Irons, Thekla Reuten, Douglas Hodge. Dominika Egorova (Jennifer Lawrence) is a celebrated ballet dancer at the Bolshoi. The Bolshoi pay for her to live and support her sick Mother whist she performs for them. A seemingly freak accident happens during a gala performance and ends her career quite abruptly and leaves Dominika unable to continue supporting her Mother. Her Uncle, Vanya Egorov (Matthias Schoenaerts), offers her an opportunity to work for the government in return for continued support for her and her Mother but she has to show that she has something to offer. This just the beginning of what becomes a complex tale of espionage as both the Russian and American intelligence agencies show an interest in Dominika with their own motives for this interest but of course she has her own ideas about the path her life will take. It’s another very busy cast and it’s another fairly well-chosen one. From not caring much for Jennifer Lawrence I think she’s really come a long way. As Dominika she shows a colder side to her skills whilst for the early stages of the film she’s clearly a quite vulnerable individual. She pairs off quite well with Joel Edgerton when they do actually share some screen time but there so much more going on that this has to be time limited otherwise we might be looking at a good three hours of film, not necessarily a bad thing but at two hours and twenty minutes it’s probably about right. Edgerton himself gets something better to sink into after the awful Bright, which I’m sad to see has had a second installment announced. Edgerton’s CIA operative, though, doesn’t seem to be all that hard-edged and a little more compassionate than you would expect from someone in his line of work. Charlotte Rampling and Jeremy Irons bring some veteran class to the table and no less than you would expect from two seasoned performers such as themselves. The rest of the cast put in a very good shift in support to the main players. Red Sparrow is a very decent watch. The aforementioned running time could have left some areas where it felt stretched but there’s so much going on here that the viewer’s attention was required throughout. There was always something going on that had to be taken into account that would contribute to the overall story and conclusion. It was very much a thriller of the kind we got during the eighties and the cold war era. It’s a quite brutal movie in parts with some scenes of quite horrific torture that are guaranteed to make you wince. A strong cast create the kind of sombre atmosphere to a movie that’s never going to be a light tale with a happy ending but that of a grim world of desperation, treachery and scorn.